Dr. Richard Lin graduated from Yale University with a bachelors in science in Molecular Biophysicis and Biochemistry before completing his medical degree at New York University. Afterwards, he continued his internal medicine training at UCLA-Harbor in California, and then returned to NYU to finish his gastroenterology fellowship. 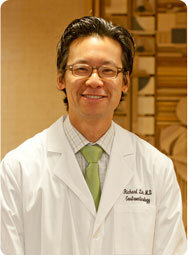 He is board certified in both internal medicine and gastroenterology. He has published abstracts in palliative metallic stenting as well as inflammation’s role in colon cancer. While Dr. Lin treats a wide variety of gastrointestinal and liver conditions, including advanced biliary endoscopy, metallic stenting and capsule endoscopy, he has a particular interest in colon cancer as well as Asian American gastrointestinal issues including stomach cancer and Hepatitis B.